John Clendon is a New Zealander who has spent most of his career working in overseas plantation businesses. John’s first overseas appointment was in 1976 as an agricultural advisor in the New Zealand Government’s overseas aid programme. In 1980 he joined the Unilever Plantations and Plant Science Group and for the next 18 years was employed in various management positions in Solomon Islands, Sabah, Thailand and finally in Johor where he was Unilever’s Director of oil palm operations in East Asia, Chairman of Unipamol Malaysia Sdn Bhd, and Director of Unifield PCL in the UK. 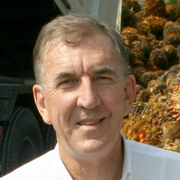 In 1998, John Clendon left Unilever to take up a position in the former Unilever oil palm business in Thailand where he remains to this day as Managing Director of Univanich Palm Oil Public Co. Ltd, based in Krabi, Southern Thailand. The Univanich business is Thailand’s leading producer with annual production of 170,000 tonnes crude palm oils, mostly derived from small outgrower farmers. In 2012, the Univanich–Plaipraya Enterprise Group became the first group of independent smallholders to achieve certification from RSPO as sustainable producers. Univanich also operates an advanced oil palm breeding programme based on an extensive collection of pedigree material originally imported into Thailand under the Unilever research programme. Drought tolerant Univanich hybrid seeds are now exported to oil palm growers in more than fifteen countries. The company has also pioneered methane capture as a way to mitigate greenhouse gas emissions from palm oil mills. The company’s three CDM registered methane capture projects supply electricity to Thailand’s national grid and generate approximately 90,000 CERs annually.